Cullen Darome Jenkins (born January 20, 1981) is an American football defensive end for the Washington Redskins of the National Football League (NFL). 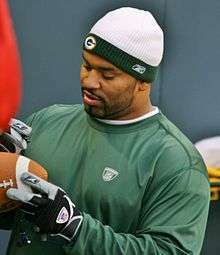 He was signed by the Green Bay Packers as an undrafted free agent in 2003. In his last year as a Packer, he won Super Bowl XLV over the Pittsburgh Steelers. He played college football at Central Michigan University. He has also played for the Philadelphia Eagles and New York Giants. On March 10, 2013, Jenkins was signed to a three-year contract by the New York Giants. He is starting with former Eagles teammate and new Giants teammate Mike Patterson in the 4-3 Defense. He is the younger brother of former Carolina Panthers and New York Jets defensive tackle Kris Jenkins. ↑ "Packers sign 11 undrafted free agents". Packers.com. May 2, 2003. Retrieved October 6, 2016. ↑ "Defensive lineman Jenkins extended by Packers", Associated Press, February 26, 2007. Retrieved on 2008-04-20. 1 2 Kapadia, Sheil (February 21, 2012). "How Jenkins' return affects the DT picture". philly.com. Retrieved 2012-02-21. ↑ Rosenthal, Gregg (February 22, 2012). "Cullen Jenkins takes pay cut, will earn $5.8 million". profootballtalk.com. Retrieved 2012-02-22. ↑ Rosenthal, Gregg (2013-02-25). "Cullen Jenkins, Mike Patterson released by Eagles". National Football League. Retrieved 2013-02-25. ↑ Hanzus, Dan (March 10, 2013). "Cullen Jenkins, N.Y. Giants strike three-year contract". NFL.com. Retrieved 2013-03-11. ↑ Czarda, Stephen (August 29, 2016). "Report: Redskins Sign Veteran Defensive Lineman Cullen Jenkins". Redskins.com. Retrieved August 29, 2016. ↑ Orr, Conor (September 3, 2016). "Washington Redskins release veteran Cullen Jenkins". NFL.com. Retrieved September 3, 2016. ↑ Keim, John. "Redskins turn to veteran end Cullen Jenkins". ESPN. Retrieved 14 September 2016.